Sort of anyway. What was released was a pre-publication scaffold of the genome. A final, published, version might include more primary sequence data, will have fewer gaps, and most importantly of all, people will be able publish their own work which draws on the potato genome. Overall I have mixed feelings on the current practice of releasing genome sequences prior to publication. As someone who does comparative genomics, having access to more genomes is great, but the agreements they’re released under severely limit how they can be used in publications prior to the publication of the genome paper itself (which can be a LONG time). Within the grasses four genomes are available (Maize(corn), Sorghum, Rice and Brachypodium) however only two of them, Rice and Sorghum, are published. Any paper making use of whole genome analysis of all four cannot be published before the Maize and Brachy papers come out (hopefully before the end of this year!). That said having even a rough draft of the potato genome is cool. Potato is a great plant for a lot of reasons. Potatoes are the fourth staple crop (behind only rice, maize and wheat) that provided enough food for people to build civilizations and probably the most important non-grass crop in the world. Currently there are no GMO-potatoes on the market, as I mentioned here. 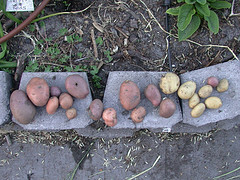 Domesticated potatoes are tetraploid and rarely breed true (their offspring aren’t much like the parents). * And I still owe it a post of its own. Another reason to be interested in potatoes are is the family tree of the species. Potato can claim tomatoes, eggplant, and deadly nightshade as close relatives. ** That whole group of species belongs to a different branch of the family tree of plants (the Asterids) from the early non-grass genomes (Arabidopsis, Papaya, and Grape) which were all in a group called the Rosids. These two groups are responsible for a lot of the diversity of species within the Eudicots*** so it’s good we are starting to starting to see Asterid genomes. *Potatoes grown from seed not sharing many characteristics with their parents is why most cultivation of potatoes is done by planting pieces of potatoes instead of seed. The plant that sprouts out of a potato is genetically identical to the plant that grew the potato. It’s a clone. Apples actually face a similar issue with apple seeds not being much like their parents. That’s why breeds of apples are propagated by grafting. A breeder cuts off a piece of a branch from one tree and carefully connects it to the stem of an unrelated apple tree. If the graft is done properly the branch will grow, flower, and produce fruit just as it would normally. So all apples of the same variety (say Gala, Macintosh, or my new favorite Cripps Pink) are clones of each other. **The obvious family resemblance to deadly nightshade was one of the reasons Europeans originally believed tomatoes and potatoes to be toxic when they were introduced from the Americas. Posted in: biology, Plants, research stories.